Everybody knows who Jenson Button and Lewis Hamilton are – and most F1 fans have a pretty good idea about what their job involves. But with this feature we’re inviting you to meet some Brits on pole that you might not have considered before – the project managers, scientists and technicians who work behind the scenes in F1 to make sure that everything comes together on the day, and who are playing at the very top of the game. The British motorsport industry is a world-leader and a consequence of this is the fact that the UK’s engineers, scientists and experts in related fields like marketing and sponsorship are working at the highest levels of F1. We just don’t usually hear much about them. We were invited along to the Ferrari motorhome, shown around its garage and given access to Shell personnel during the Friday practice session at Silverstone because that company is interested in raising its profile with F1 fans. But the business reason behind our invite doesn’t detract from the amazing insights that our interviewees were able to give us. So we thought: they can tell this story better than we can. Let’s hear it in their own words. As a result, you can learn from the sound clips below what happens in a F1 garage during a pitstop, how teams cope with the demands of FIA scrutineering, how the fuel in a racing car compares to the fuel in yours and dozens of other fascinating facts. We hope you enjoy hearing from Lisa, Stuart and Mark as much as we did. Thanks for your time, guys. Based between Shell Global Solutions technical laboratory in Chester, UK, and Ferrari’s headquarters in Maranello, Lisa works to ensure that the Shell and Ferrari development programmes are fully integrated. She attends the majority of Formula One races and her responsibilities also cover Ferrari Road Car and the Ferrari Challenge Series. She has worked at Shell for 13 years, joining immediately after graduating with a degree in Chemical Process Engineering with Biotechnology in 1995. She initially spent five years carrying out fundamental research into combustion chemistry, which she used as a basis to gain her PhD. 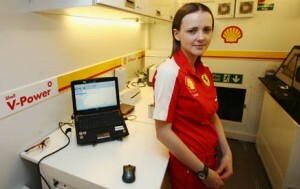 She then went on to spend five years working on Shell’s alternative fuels project before joining the Formula One programme in 2005. Four seasons working in Formula One have presented many unforgettable moments particularly the two races she attended in San Marino and the Brazil 2007 nail-biting race which saw Kimi Raikkonen clinch the double World Championship victory for Ferrari. 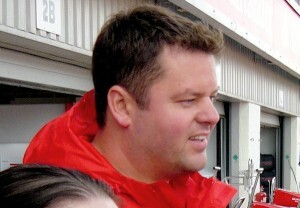 Stuart is based at Shell Brands International’s headquarters in Switzerland and has responsibility for overseeing the commercial aspects of Shell’s technical partnership with Ferrari. He graduated with a degree in marketing from Lancaster University in 2000 and worked at Reebok for four years working with football teams including his own club, Liverpool – an opportunity he describes as one of the most extraordinarly moments of his career to date. He worked in driver management for Eden Rock Sports and as a sponsorship manager for Intel and BMW Sauber at Momentum PR in London. before joining Shell in 2008. He was in the garage for last year’s dramatic last-corner title battle between Lewis Hamilton and Felipe Massa at the Brazilian Grand Prix. All this audio was collected in the Silverstone paddock while teams worked in their garages, support races went on in the background, and equipment was used to make fuel analyses. As a result it scores highly on atmosphere but there is a lot of background noise and the quality is sometimes poor. However, we still think it is worth posting these clips relatively unedited for the insight they give into areas that we’re not usually able to learn about. A transcript will be added for every sound clip to compensate for any difficulties you might have in hearing clearly. Because we know that what F1 fans really want is gratuitous audio files of that wonderful, wonderful noise, here are a couple. Below you can hear the sound of cars hammering down the Silverstone pit straight during Friday practice. Next comes the aural experience of sitting at Woodcote as the drivers either line up Copse in their sights or head into the pitlane entrance. Ear protectors at the ready!